BIG IDEAS opening a BIG HIT! After months of planning, designing, installing, tweaking and talking, the BIG IDEAS exhibition of young people’s art launched with an appropriately BIG BANG! 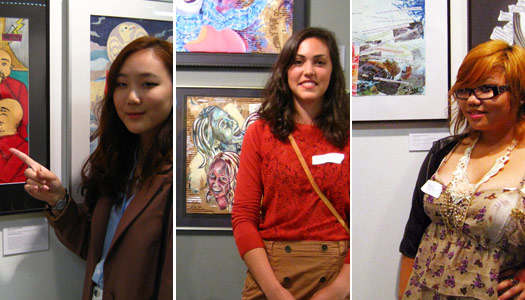 The ArtStarts gallery was filled with a wonderful array of well-wishers, from the young artists and their teachers to school superintendents, event organizers from the Vancouver Biennale and ArtStarts, important community contacts, friends, family and more. Adorned with nametags bearing hints to “Talk to me about ______________”, guests explored the artwork in the gallery and found moments to connect with friends, colleagues, and complete strangers. Meanwhile, the young artists posed for photos in front of their artwork and shared their experiences and inspirations with interested onlookers. The opening remarks were a great opportunity for everyone to gather to learn more about the exhibition from its organizers. Keiko Lee-Hem, ArtStarts’ Exhibitions and Residencies manager and curator of the exhibition, played host, introducing the room to ArtStarts’ vision and sharing a bit about how the exhibition came together. Katherine Tong, Vancouver Biennale’s (VB) Education Program Manager then talked about their organization and did a wonderful job of acknowledging all the individuals that had works so hard to make the school outreach initiative such a success. VB founder Barrie Mowat, with bright yellow socks peeking from under his pant cuffs, took the opportunity to promote the VB’s next initiative, the Bikennale, before Keiko invited her next speaker to the “stage”. 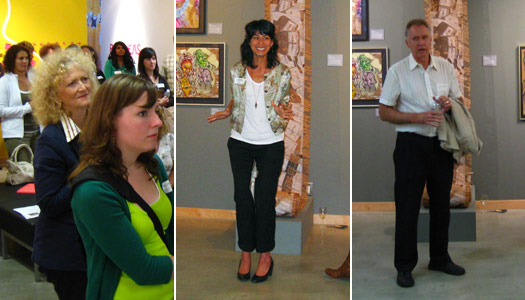 Opening remarks with onlookers, exhibition curator Keiko as host and one of the speakers, Terry Howe. As the chair of Vancouver Biennale for Schools and ex-principal of King George Secondary, Terry Howe played along as Keiko conducted a mock interview with him. After joking that he was “forced” into the position by the ever-persuasive Katherine and Barrie, Terry became more serious, acknowledging the great privilege he felt being involved with the creation of the lesson plans and the positive impact that he recognized amongst students. Finally, one of the participating students, Katie Keyes, came forward to share her thoughts, offering everyone insight into her artwork and the impact that now seeing it on the gallery walls had on her, saying, “This is incredible. I could never have imagined when I was working on my piece in my classroom that it would now be here in a gallery.” For ArtStarts team members and many others in the room, Katie’s words truly highlighted the value of showcasing young people’s art in a professional setting. 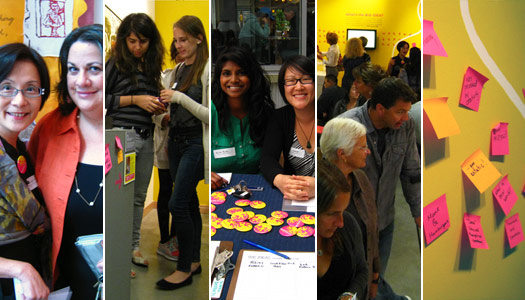 A great night celebrating young people's art and the hard work of ArtStarts and the Vancouver Biennale. The remainder of the evening saw a continuation of the high energy and interaction that it began with, with guests enthusiastically plastering the walls with their thoughts and comments on colourful sticky notes. "…[discovered] new insight into your world." "…[found] connections and new ideas." See the gallery of photos on our facebook page and while you're there, give ArtStarts a Like! Come check out (and be a part of) the exhibition for yourself! Get all the details here. See all 400+ pieces of student artwork in the VB Learn Online Exhibit.